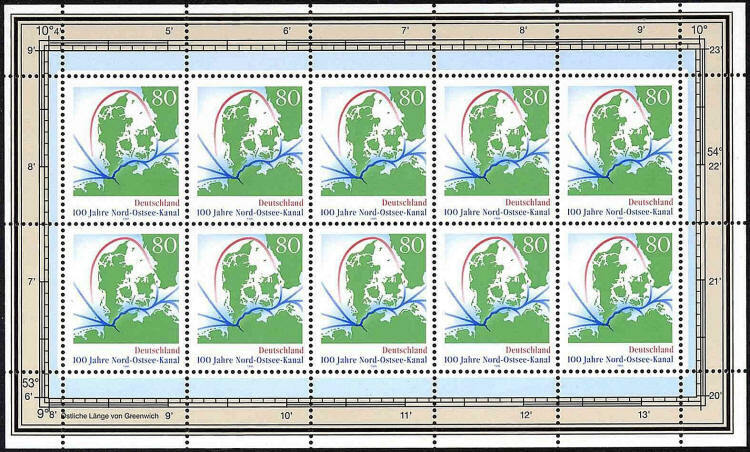 Volker Woesner, a member of the CartoPhilatelist Society and Arge Landkarten – Vermessung - Entdeckungsgeschichte der Erde (the map-stamp topical society in Germany) has pointed out to me several errors on the minisheet of the Kiel Canal stamps issued by Germany in 1995 to commemorate the 100th anniversary of the canal. These errors concern the scales on the margin scales. The canal extends from 9°08’E 53°53’5” to 10°09’E 54°22’N. A comparison of these coordinates shows the errors on the minisheet. The only one which is accurate is the one at the bottom left, 9°08’E. All the others are wrong! Not only so, but the scales at the top and bottom do not agree, nor to the scales at the right and left.. The scales at the right and at the top is clearly a decimal scale, while the one figures are minutes. Only Great Britain uses a decimal grid system.